Back in 2008, we thought it would be fun to be able to splash different colors of light on the front of the house and garage in certain parts of the musical sequences. Since that time, we have expanded and improved this effect by using various different types of lights. Since all of these are LED fixtures, they take very little power for their brightness, and fit into our long-term plan of using efficient LED technology throughout the display. We have to give special recognition to our friend Bob Zajac. 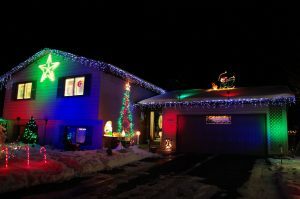 Bob and his family do a wonderful display in Waconia, Minnesota, and one of the many things he does extremely well with his display is the use of LED color floods. After watching Bob’s house change from red, to green, to blue, to white, and a myriad of multi-color options, we got the bug to try to this sort of effect ourselves. Not only has Bob been a great resource to us over the past few years, he also made a very generous donation of some DMX equipment that we now use in our display. A post holding one of our original MR-16 banks (bottom) and a Rainbow Flood (top). Picture taken during the 2011 season. The original LED wash fixtures we built in 2008 used LED MR-16 bulbs. Tim ran across a deal on some of these LED spotlights, and with some guidance from some online friends, proceeded to create several banks of these. 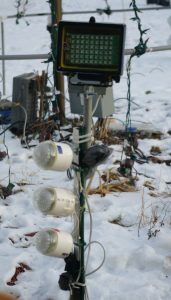 Each fixture contained a Red, Green, and Blue spot light and was controlled by a special low-voltage controller to sync them up with the rest of our lights and show. 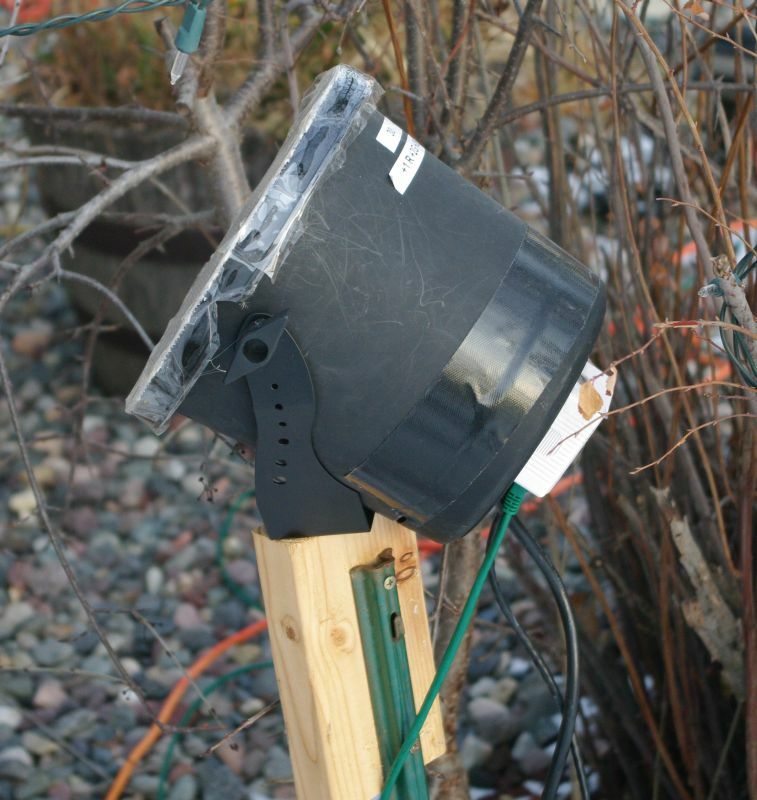 We designed our own weatherproof enclosures for the MR-16 bulbs, and created a detailed how-to on how we did it. 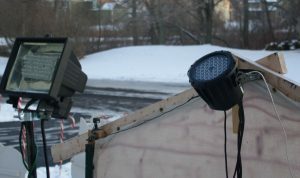 By the 2011 season we were still using two of these fixtures to help light the front of the garage, but had switched to other technologies for the rest of the wash effect. In 2010 we switched to using a new kind of flood, called the Rainbow Flood, on the front of the house. These floods came as kits – basically bags of LED’s and a bare circuit board, that Tim soldered together and placed in gutted halogen work light enclosures. The Rainbow’s are true RGB devices, meaning the color mixing is better than with the MR-16 banks. In 2011, we once again changed the techology of the lights on the front of the house (keep on reading below), and moved our three Rainbow floods over to the garage – two on the roof, and a third on the garage door (although the door is dark and doesn’t lend itself to being ‘washed’). The Rainbow floods ran off of the same DC controller as the MR-16’s. Also in 2010 we picked up a new flood called the vFlood. The circuit board of the vFlood looks similar to the rainbow in that it’s a board full of LED’s. However, the vFlood uses a much brighter LED than the Rainbow did, and the colors are truly awesome. It’s coupled with a “vDrive”, a special controller that powers the LED’s in a safe way, and speaks the DMX protocol. DMX is the lighting control standard used at concerts and theatrical events, and this single flood was our first use of it in our display. As such, it required a special LOR device called the iDMX to bridge between our standard Lightorama network and the DMX device. Since then we’ve added a lot more DMX to the display, including our North Poles, candy canes, and even our pixel mega tree. We used this vFlood on the garage door in 2010, and were so impressed with it that we purchased two additional ones for 2011 to use on the front of the house. They provide for an even brighter and wider color pattern than the Rainbows did in 2010. Like the Rainbow floods, we used a gutted halogen work light enclosure to hold the vFloods and vDrives. Each pair of circuit boards goes inside a fixture. They take 12VDC power input and a DMX signal, and are otherwise self contained. The rainbow floods were repurposed for the garage door and garage roof in 2011. In 2012 we phased out the original MR16 spots completely. Their last duty was to wash the front of the garage in the 2011 season. We replaced them with two commercial units in 2012 which were brighter and run on the DMX protocol. 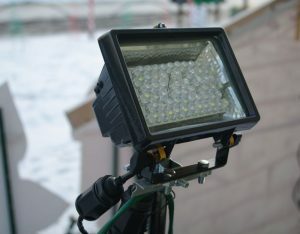 We are also using a few standard commercial DMX wash fixtures in the display starting in 2011. 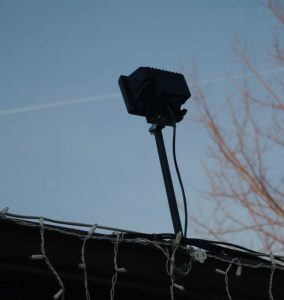 One of these fixtures can light up the gable peak of the front of the house (where the large star is), and a second one lights up the west side of the house. For the 2014 season we phased out the Rainbow floods on the garage roof when Tim was able to purchase two more vFloods from a friend who was no longer using them in his display. The vFloods provide better color even when there’s no snow to project onto. In 2015 we finally found a way to properly color-wash our garage door. 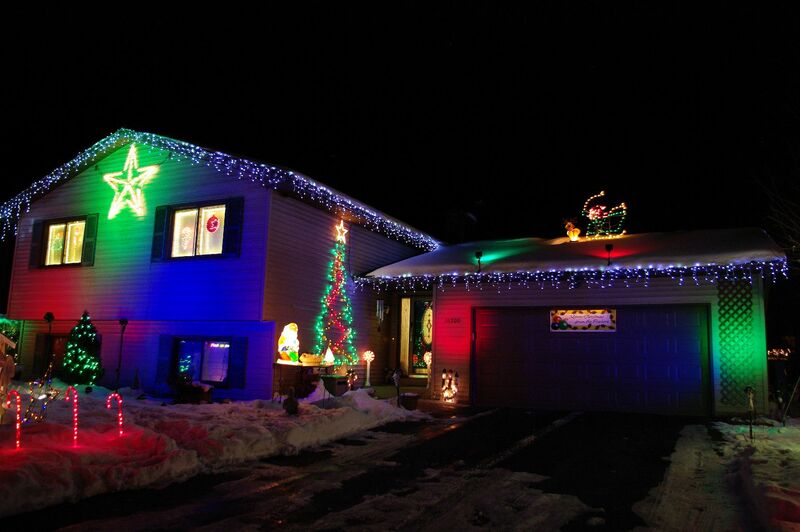 Tim permanently installed a digital strip of LEDs at the top of the garage door frame. These are pixel LEDs and thus the strip can be any color and many colors at the same time, as well as do animated effects. They are also bright enough to give our dark door some color. Since this strip is permanently mounted, we sometimes light it up in the off-season, for example Green for St. Patrick’s Day, or Red/White/Blue for the 4th of July. This looks a bit oddball but it works great. 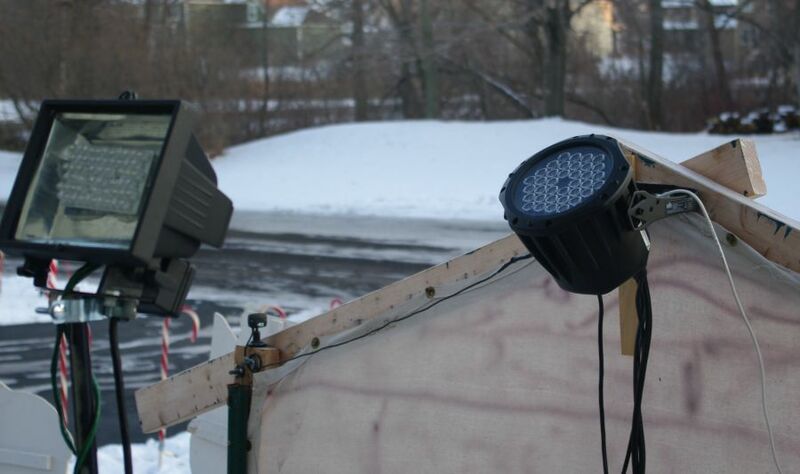 Inside is a Colorsplash 200B commercial DMX fixture, which is not weatherproof. A black flower pot and a clear lighting lens makes it so we can use it outdoors. This picture shows one of our vFloods (on a pole, foreground) and a commercial DMX fixture aimed at our gable peak (background, mounted on the Nativity backdrop.